First off….has it really already been 8 months since we have seen Prism!?!?!? Jon and I have been sucked back into land life in full force. Besides the fact we get to be with friends and family once again… we are really, REALLY missing Prism. Once Jon and I went our separate ways from Jet on the East Coast, we have been very busy! 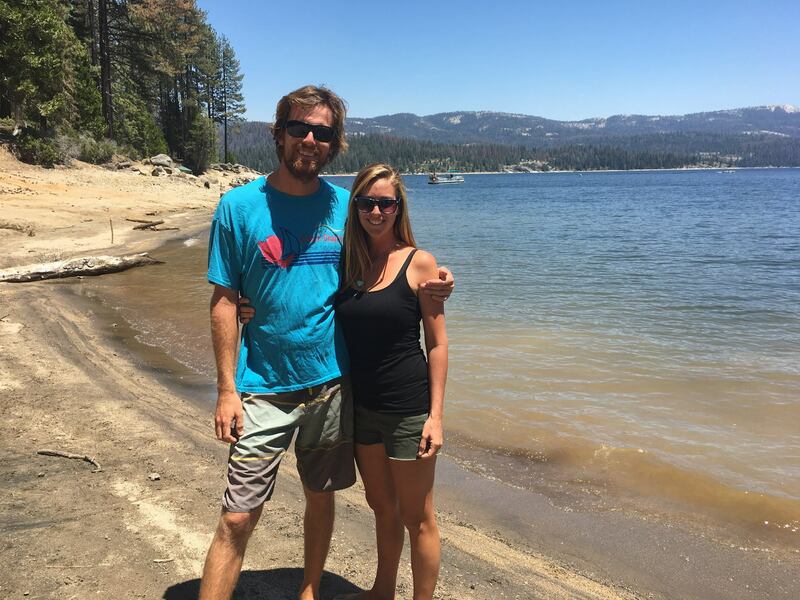 As soon as we got back into California, Jon’s mom had something planed as a family pretty much every day with fun filled sailing trips in the bay, being out on the lake or visiting friends and family all throughout California. Friday night jazz in Sausalito. With all the planned travel Jon and I realized we were going to need a car. Sadly, one a little more realiable than our much loved 94’ 4runner. So we bought a brand spanking new 2017 Hyundai Accent, 6speed manual, which is so fun to drive and gets 45-48 MPG! reunited with my best childhood friends Katie and Kelly! showing and helping the littlest nephew to shoot a 22. So enough about all of that… here is the download, as I am sure you are all wondering why we are still on dry land during this prime winter cruising season. Originally when we set sail back towards the states it was because of 2 main reasons, 1) Prism needed some TLC ( which we wanted to do state side to access our wholesale accounts) and 2) Weddings. No, not mine and Jons, but many others which we would not and could not miss, including my best friend, my brother, Jon’s brother and Jon’s best friend. So instead of storing the boat in a marina in Columbia or Panama and flying back for each wedding which would have been about $4000 in airfare alone, we decided to sail home. Plus remember that shinny new red engine we put in last year,(yea the same one which Jon tried to squish me while taking out the old one) yea that kind of ate up a lot of our savings even with the incredible price we got the engine for. So the plan was to sail home, be in California for the hurricane season and the first set of weddings. Then head back to Prism to give her some much needed TLC and elbow grease to make her look so shinny and new with new sails, new decks and a paint job. Jon and I drove out to Moab to visit Jess and Josh for Josh’s 40th! Hiking in Moab with Jess, Josh and Vela! Once we decided to stay and really save up some money for our Europe adventure, Jon and I got back into our old jobs. I was asked to work at China Peak Mountain resort to help run the accounting department. Which I started in October but winter never really came, and the resort opened then closed and then repeated. So Jon and I made the decision to move back to Berkeley. And wouldn’t you know it, the day we moved, it snowed. As soon as we were off the mountain winter came! Kinda funny and as we all know California really needs the snow and rain right now. So we are very happy to be back in the Bay. I am once again working at BMC while Jon is staying very busy shooting all over California and the US for companies like PBS, Valley Children’s Hospital and doing spots for California cities. Buying that new Hyundai has been a huge life saver, we did the math yesterday and found out that we have saved over $3000 in gas alone with this car compared to our old 4runner. ( I still miss it though). I have a feeling by the time we set sail again in the fall the gas savings will have paid for our new car. Everyone keeps asking if we are going to continue making videos, and the answer is YES! Jon and I do not have as much free time as we used to for editing the episodes (which do take a lot of time to edit). So thank you to everyone for being patient. Jon and I will remain in California until fall, when we will return to Prism to do the much needed work on her, then sail out to the Bahamas maybe for the 2018/ 19 Winter season before sailing up the coast in preparation for our spring 2019 Atlantic crossing! Prizm make it through the hurricane ok? Hey kids! Would you post another update soon? We’re all hoping to see you back out there very soon! I was glad to find your site and news of you guys. I lost track a year or so ago and wondered what had happened. Glad to know you two are still together and getting ready for more adventures, which I will follow and enjoy for sure. Ditto to above. What a great together active couple.